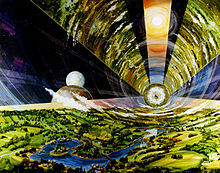 Constructing the first space habitat will most likely happen in GEO and will probably take years. Of course, humankind's inevitable learning curve will likely enable subsequent habitats to require less construction time; but still years. During the construction, first complete the outer hull then the inner hull. After the hulls are complete, the terraform process will proceed in parallel with the rest of the habitat construction. • make and/or import elements for mirrors and solar cells. • deploy exterior mirrors to effectively reflect sunlight. • construct windows in outer and inner hulls. • align all windows with deployed mirror(s). • transparent windows contain transparent water between hulls. • augment with solar cells as required. Heat Rejection. Space habitats might need to radiate excess heat from absorbed sunlight. Some habitat designs could distribute coolants, such as chilled water, between the inner and outer hulls. • Use heat from mirror to liquefy, filter and perhaps even boil to purify and greatly enhance transparency. 1) RADIATION BLOCKING is best done with materials with high hydrogen content, such as water, which can reduce primary and secondary radiation much better than metals or asteroidal regolith. 2) FUEL SOURCE: After extensive heating by external mirrors and habitat's internal heat rejection system, radiated inter-hull water should readily undergo super-heating to become plasma fuel for space tug's particle acceleration system. 3) LIFE SUPPORT's most obvious aspect is to keep humans as well as on-board flora and fauna hydrated. HOWEVER, water's life support roles are so pervasive, we use subsequent frames to help describe them. These include atmospherics and agriculture. 4) RECREATION: Perhaps a lower priority, but still important; water activities can greatly enhance life on a habitat. Too numerous to list comprehensively, they include: swimming, fishing, boating, skating, etc. Earth-like air requires one standard atmosphere (14.70 pounds per square inch = 1,013.25 millibars) composed of nitrogen (78%), oxygen (21%), some carbon dioxide, and traces of a few other gases. Nitrogen (N2) is very stable in Earth's atmosphere and is not involved in most of its chemical reactions. Consequently, it has increased to current levels over geological time. Thus, the initial supply of nitrogen in a habitat's atmosphere might require some import from Earth's plentiful supply; however, it will most likely not require replenishment for some time. Though very stable, nitrogen is essential for life on Earth; nitrogen compounds constantly cycle between the atmosphere and living organisms. 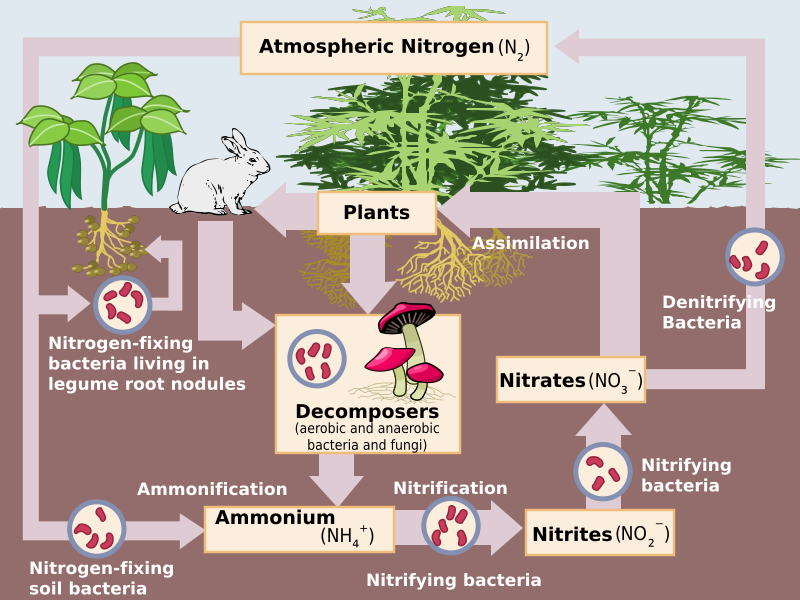 1) Nitrogen "fixes" into a plant-usable form, usually ammonia, typically done by specific bacteria via specific enzymes. 2) When taken up by plants, the ammonia is used to make proteins. 3) By eating these plants, animals form their own nitrogen bearing proteins and excrete nitrogen bearing waste. 4) Finally, these organisms die and decompose, returning free nitrogen to the atmosphere. Habitat’s oxygen (O2) could replenish via several ways. 2) Habitat fauna will inhale oxygen and exhale high levels of carbon dioxide. Thus, habitat might use a catalytic chamber to decompose some of the CO2, extract the carbon and put fresh O2 back into the habitat's air supply. 3) Finally, extract O2 from water via the electrolysis method, an electric current passing through the water. 1) Hydroponics: immersing plants in tubs of treated water. 2) Green houses: glass structures protecting plants on tables. 3) Hanging gardens suspended from walls of the habitat's many residences. However, best method will likely involve Terran topsoil. • Robots and other AI devices prepare soil and tend plants. Initially, such devices will be essential until habitat's oxygen level suffices for humans. Even then, robots will prove useful to help humans avoid inevitable tedium associated with repetitive, agricultural tasks. • Seed Crops. Grow several generations for enough seeds to eventually harvest enough crops to feed habitat population. Habitat will likely model a terrestrial Seed Bank with numerous seed samples..
• Raise domestic livestock, mainly herbivores, for milk, meat and other animal products. Consider a few omnivores (perhaps cats and dogs) for pets. After many eons on Mother Earth, humans have become exquisitely adapted to Earth's gravity; it's essential to long term health. Extended zero g causes adverse reactions which range from minor nausea to bone loss and even organ failure. Of course, long term zero-g greatly degrades ability to readjust back to 1-g conditions. Thus, extended space time mandates a 1-g environment. 1) Max living area (AHull) on inside surface of hull is determined by cylinder's radius (r) and length (l). 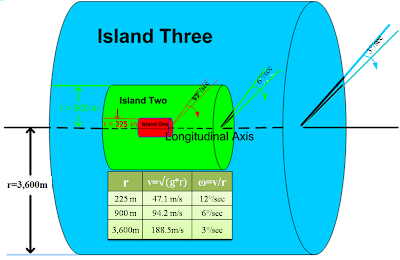 Example: Consider O'Neill's "Island 3"
Example: Continue with "Island 3"
3) Angular Velocity. To optimize quick human adaption, angular velocity (ω ) should not exceed 3°/second. Still using "Island 3" example. Architecture of Artificial Gravity When simulated gravity comes from centripetal force due to longitudinal spin, east and west becomes gravitationally distinct; paradoxically, up and down become visually indistinct and ambiguous. Coriolis Effect When moving towards or away from the axis of rotation, a force pushes towards or away from the direction of spin. Thus, the inner ear causes dizziness, nausea and/or disorientation. Attaining Artificial 1-g requires many rotational increments for as long as 3 years; thus, habitat requires reinforced structure to withstand inevitable stress. As an added benefit, stronger habitat will better contain breathable, Earth-like atmosphere. Visual Orientation. In O’Neill’s cylindrical habitat, one will often see the ground above and the sky below depending on one’s position relative to the solar windows. A panoramic view of the celestial heavens might be best observed from a glass-walled capsule tightly tethered to the habitat. to gain artificial 1-g gravity for two huge habitats. Deploy a pair of counter-rotating habitats and couple them as shown to form a closed system. Thus, angular momentum is conserved, and they combine for zero axial angular momentum. Once the compressor tower transmits enough centrifugal force to the cylindrical habitats, rotation continues without additional force; no thrusters and no propellant required..
To spin-up the cylinders, transmit static torque through the compression framework as shown. For convenience, arbitrarily assume compressor capacity can spin the cylinders to 1-g in 3 years (about the same time needed for space colony's agriculture to become productive). After spin up, the compressor can continue maintenance power to overcome frictional losses as well as attitude control to overcome precession and keep habitats pointed toward the Sun. Tensegrity advocates, Longman and Skelton, propose an alternate 1-g spinning structure formed with Earthly exported UHMWPE materials and filled with in situ, asteroidal metals and regolith. Furthermore, they suggest avoiding the precession adjustment requirement (i.e., keeping habitat pointed toward Sol), by re-orientating spin axis to be perpendicular to the ecliptic plane. Power Process Initially from sunlight reflected off of adjacent mirrors. Eventually, habitats will position further from Sol; then, they’ll probably use He3-He3 fusion reactors. Aquatic Process Initially from water imported from Earth’s huge oceans. Eventually, habitats will get water from comets and other celestial sources. Atmosphere Habitat must maintain 78% Nitrogen mostly from imports; however, it will likely maintain 20% Oxygen through various regenerative sources. Agriculture Before humans maintain a permanent presence, habitats must grow its own food. Initial seed crops must be grown by autonomous robots; subsequent food crops grown by monitored robots; then, consumed by humans and fauna. Artificial Gravity Done by centrifugal force via spinning at correct angular velocity. To gain the required enormous angular momentum, TE assumes a “compression tower” linking a pair of habitats will slowly increase longitudinal spin until attained. Once at required velocity, angular momentum should be conserved for long durations.